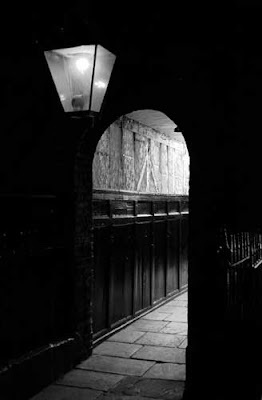 I was wandering the streets of London on Monday - actually trudging would be a more accurate description of my activity - when I came across this Dickensian alley close to the busy throughfare of Piccadilly. Although I'm used to seeing gaslights in use close to home in Great Malvern, I hadn't realised there were still a few left in the Great Wen. What's more it wasn't in a particularly touristy area; it appears that this minor public right-of way, and the courtyard it leads to, has escaped the passage of time and the onward march of progress. I've now identified exactly where I was standing when I took this picture. It was in Pickering Place, off St James's Street. It was home to the Republic of Texas's embassy until it joined the US union in 1845. It also has two claims to fame - it is the smallest public square in Britain (I can attest to that - cat-swinging was not an option) and it was the last place in England where a duel was fought - walking back twenty paces would have been a bit tricky.